Late on the morning of Sunday 1 April 2012 we left our home in St Helens for our Easter break to Milarrochy Bay Camping and Caravan Club site on the eastern shores of Loch Lomond. This was a trip down memory lane, as we had last visited this site on our first family camping holiday in 1992. For our 2012 visit we had booked 11 nights. From St Helens we joined the M6 northwards and made good progress, stopping at Tebay Services for lunch. We love these independent services which are so superior to the “chain” run services in every way. We were able to park in one of the dedicated caravan parking pitches even though the services were very busy. We took it in turns to visit the toilets and purchased take-away meals from the take-away outlets. We then sat on the grass next to the pond from where we could keep an eye on the van. Cary had a steak sandwich and I had a hand-made pie and hand-cut chips. I also purchased a hand-made pork and stilton pie from the farm shop which sells a wide range of local farm-produced products. After lunch we continued our way northwards on the M6. North of Carlisle we crossed the border into Scotland and continued northwards on the A74(M) and then the M74. We stopped briefly at Happendon Services and Cary took over the driving. We drove through Glasgow on the M74 before joining the M8 westwards. At junction 30 we turned north onto the M898 and crossed the River Clyde on the Erskine Bridge. We crossed the Erskine Bridge and continued north on the A82. Just north of the bridge we were stuck in traffic on the A82 for quite some time as a result of roadworks. Eventually we turned onto the A11 through the outskirts of Balloch. Cary is not keen on towing on minor roads so we stopped in a layby and I took over the driving again. 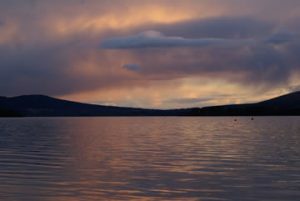 The campsite is located on the minor road which runs along the eastern side of Loch Lomond. This road is reached by leaving the A811 at the village of Drymen and taking the B837 to Balmaha. At Balmaha the road narrows considerably. Immediately on leaving the northern end of the village there is sharp right-hand bend followed by steep hill – the Pass of Balmaha. Care needs to be taken in negotiating this hill, particularly when towing. Milarrochy Bay itself is reached after about 1.5 miles, where there is a large car park, a small National Park Information Centre and a public slipway for boat launching. Milarrochy Bay Campsite is about 0.5 miles past this centre and clearly signposted on the left. The barrier is always closed during the daytime and locked at night. The exit is on the far side of reception via a large gate. There is an overnight/visitors’ car park next to this gate. The exit is poorly designed. The view of the road, which is single track at this point, is obstructed by overhanging trees. In addition there is not sufficient length between the gate and the road for a caravan outfit to stop after the gate has been closed. On our departure I had to drive out onto the road to allow Cary to close the gate, and then she had to run 100 yards up the road to join me waiting in a passing place! The site is quite large and the pitches are very well spaced out. To the right of the entrance, from the road, there is a large pitching area with a mixture of grass and hardstanding pitches with EHU. 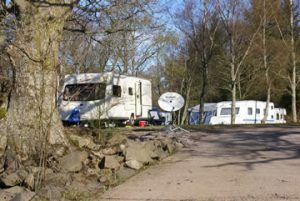 The pitches nearest to the Loch are mainly hardstanding and on flat ground; the site then slopes upwards away from the Loch. There is a smaller “backpackers” toilet block in this area with a washing-up area and dining room. The site is popular with walkers as the West Highland Way passes the entrance. Next to the reception there is a small information room, plus the main toilet and shower block. To the left of the entrance is a storage area for caravans. Beyond this there is a storage area for boats, and nearer to the lochside a further large area of pitches without EHU. The site has a long lochside frontage with a small rocky beach. There are 2 concrete slipways for boat launching for which a fee is payable. Many people using the site have canoes and other water craft which they launch from the site’s slipway. We had originally planned to take our Zodiac inflatable boat but decided against this due to the poor weather forecast. Our pitchThe road along the Eastern side of Loch Lomond is a dead-end and so the site was wonderfully peaceful. A downside of the site IMHO is that the trees around the site screen it from the best mountain views. The water’s edge hardstanding pitches were already booked when we made our booking; they’re the popular pitches, but we were fortunate to get a semi-hardstanding pitch near the water’s edge on an unmarked pitching area. The wardens were always very helpful and allowed us to move our van when the overhanging trees prevented us getting a signal for our TV satellite system. The weather was mixed with some wet and some sunny days. We managed to avoid the snow which fell on Glasgow during our stay, although the snow did cap some of the mountains to improve my photos! 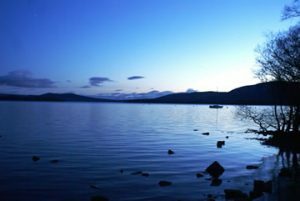 Stunning view of Loch LomondThe village of Balmaha is less than two miles away by road. It is a small Lochside hamlet with a couple of pubs, a small village store, a few houses and not much else. We found the village shop to be both expensive and not very well stocked. There was a new National Park Information Centre opened for the first time during our stay which was very pleasant with informative and interactive displays, including some for children. The centre is situated in the large public car park and includes public toilets. The staff were pleasant, well-informed and helpful. The village has a marina and small boatyard from where boats can be hired. There is also a ferry to the nearby island of Inchailloch. The Millennium Forest Trail from the centre of the village leads past the ferry pier and along a partly paved path to the high viewpoint of Craigie Fort before returning along the shores of the Loch. Craigie Fort gives spectacular views along the Loch to the mountains at its northern end. The larger village of Drymen is situated just under 6 miles from the Campsite. It has a number of shops including a butcher, village store and “Spar” minimarket. We did not stop at Drymen as we preferred to shop at the larger Co-op in Balloch, but had to drive through every time we went out from the Campsite. The nearest town of any size is Balloch which is about 13.5 miles away. Balloch is not a particularly attractive small town, situated on the River Leven at the southern end of Loch Lomond. It has a good tourist information office, a selection of small shops, several pubs and restaurants, a McDonald’s and a well-stocked Co-op supermarket. Balloch also has a rail station which connects it with Glasgow.